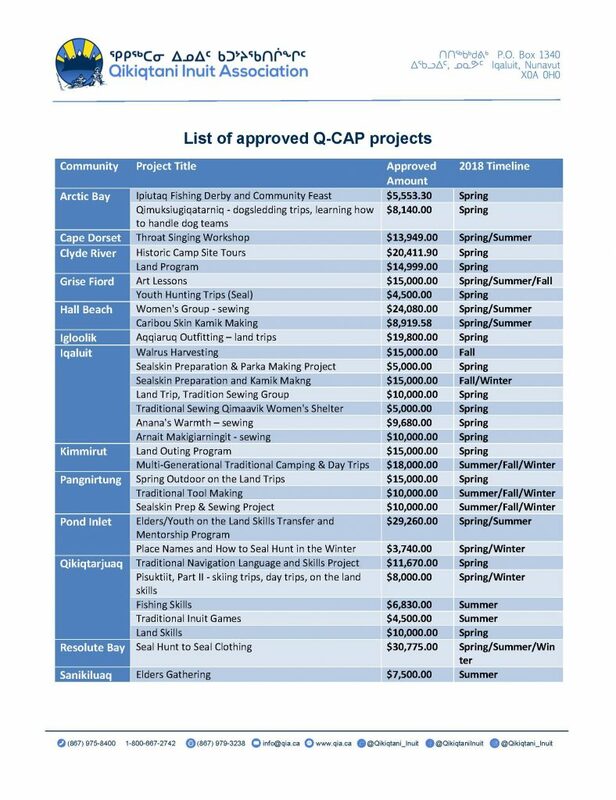 Iqaluit, Nunavut – June 18, 2018 – The Qikiqtani Inuit Association (QIA) is pleased to announce the approved list of QCAP – the Qikiqtani Cultural Activities Program projects. The 31 successful applicants include projects from individuals and community organizations from all 13 Qikiqtani communities. The projects include activities such as fishing derbies, hunting and on-the-land trips, throat singing print making workshops, sealskin preparation, and parka making. Under QCAP, each community can now access up to $53,000 for programs this year. The initial budget was for $33,000/community but because of additional money in the Benefits Funds, the QIA Board decided to increase the budget for this year’s program at the May board meeting in Qikiqtarjuaq. Although land and sewing programs are given priority, QIA will also consider other Inuit cultural programs. The new program is designed to be more accessible, with simplified application and reporting processes. QCAP was one of the programs selected by the QIA Board of Directors in October 2017 to be part of the new Benefits Fund spending. Money for the Benefits Fund is derived from the Legacy Fund, as the Legacy Fund grows its revenues go to the Benefits Fund to increase programs for Inuit. The full list of QCAP approved QCAP projects is attached. The second QCAP call-out will be issued in mid-July 2018.